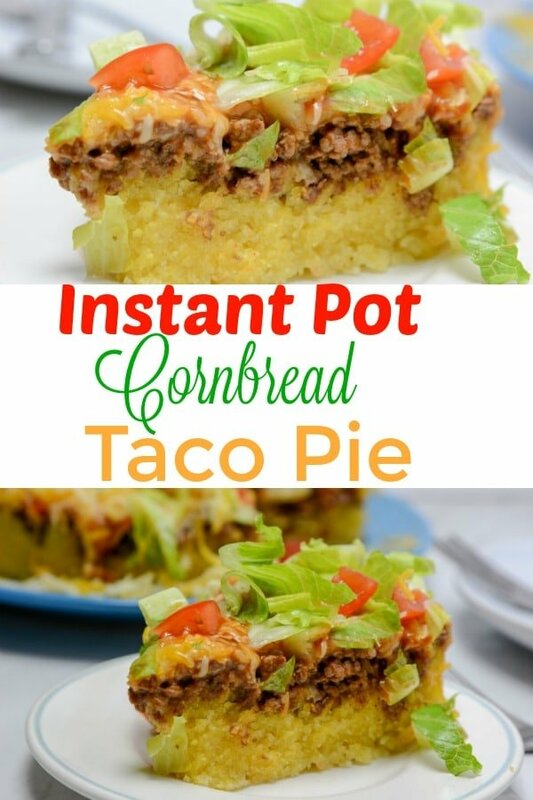 This Instant pot cornbread taco pie isn’t like all the other tacos on the block! 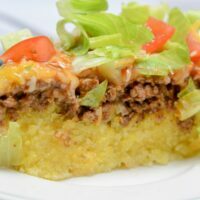 Golden brown cornbread that is topped with all the fillings a taco would have! Seasoned meats, crisp iceberg lettuce, tomatoes, and all the other fixings to complete a perfect taco. What are you waiting on? Grab your Instant Pot and let’s get cooking! Taco Tuesday’s is a thing at our house. We love an excellent Tex-Mex dish, and what better way to celebrate than on a Tuesday to break up the week. 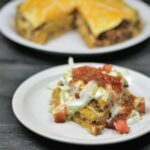 I was on the hunt for a new and creative meal, and my cousin Jamie shared her cornbread taco pie recipe, and I instantly knew it was a must make! Grab a boxed cornbread, we use one that has jalapeno to add some kick, but you are welcome to use any brand or kind you like. Then on top goes perfectly cooked taco meat that you can layer on any taco condiments you want. In our home, we love to mix it up with the toppings. I generally use what I have on hand and create a tasty dish that we all can enjoy. I like to add a dollop of sour cream for that tang, and it can tame down the jalapenos in the cornbread. Truthfully you guys, the process is a breeze. 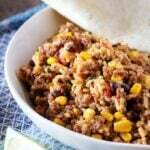 You start by cooking that ground beef until it is perfectly cooked, toss in your taco seasoning and let it marinade for a few minutes. Pour the meat mixture into your pan that you will be putting into your Instant Pot. Next, in a separate pan, mix up your cornbread according to the package. Pour over the meat mixture, and cook. Once it is done, pull it out and flip it over, so the meat mixture is on top. Slice, and top with your favorite taco condiments! Super simple to make, and the cornbread pairs well with the taco meat. I think once you make this recipe, you will keep coming back to make it again and again. It was an instant favorite in our home! 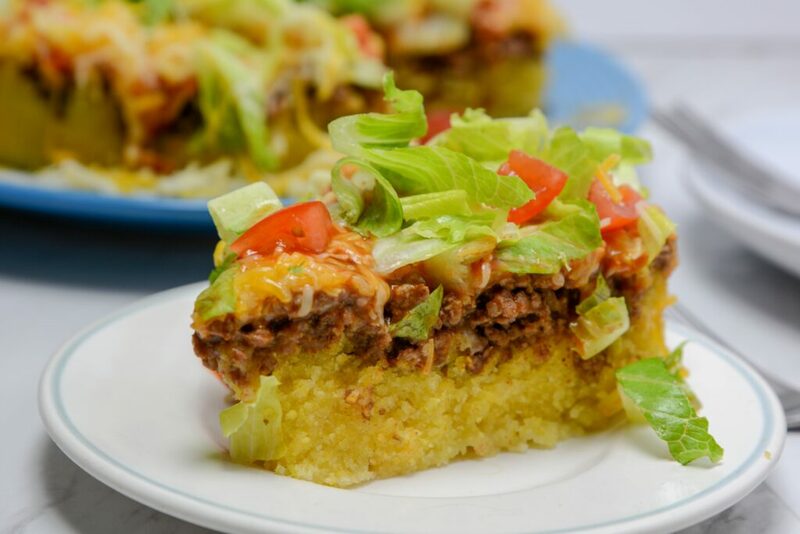 This Instant pot cornbread taco pie isn't like all the other tacos on the block! Golden brown cornbread that is topped with all the fillings a taco would have! Seasoned meats, crisp iceberg lettuce, tomatoes, and all the other fixings to complete a perfect taco. What are you waiting on? 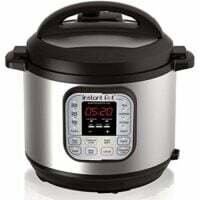 Grab your Instant Pot and let's get cooking! Top with taco sauce, cheese, lettuce and tomatoes, Serve! 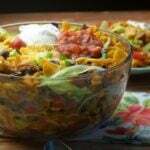 I came across this recipe the other day and made it for my family, it’s now on my family’s weekly meal schedule. 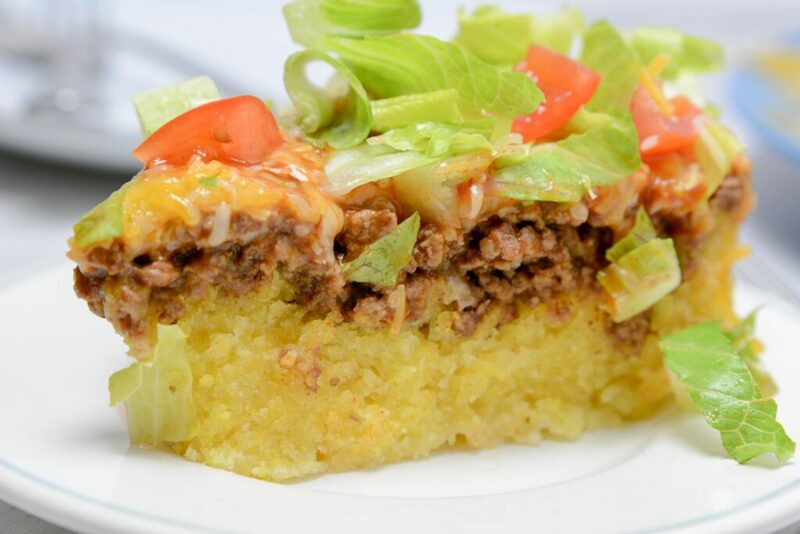 The salty of the taco meat and the sweet of the cornbread makes for an amazingly tasty meal. I made this tonight and the center wasn’t done. I followed the directions exactly. We ate the edges and it was very good. I guess I’ll add more time next time around. What size of cornbread mix?